After nine months or so Global Acts of Unity was back in Manchester. We were visiting schools from 18th March to the 27th. 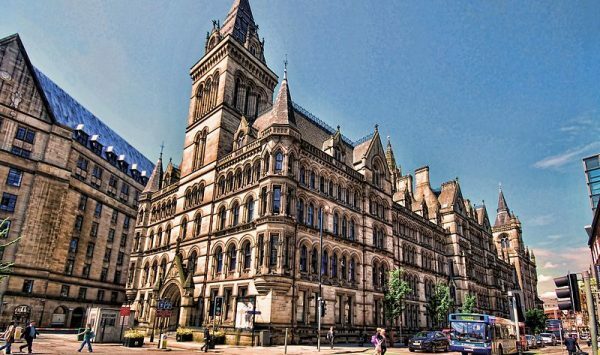 Manchester has always been a joy to visit, such a bustling busy city full of northern charm. We were glad to be back here. My readers will know that I was in Manchester after the bombing at the arena, another cowardly attack designed to cause hatred. I was so impressed and inspired by the Mancunian response to that act of hatred that I on my last visit got a Manchester Bee tattoo. That Mancunian rejection is alive and well. Every time we visited a school we did two presentations at each s school. 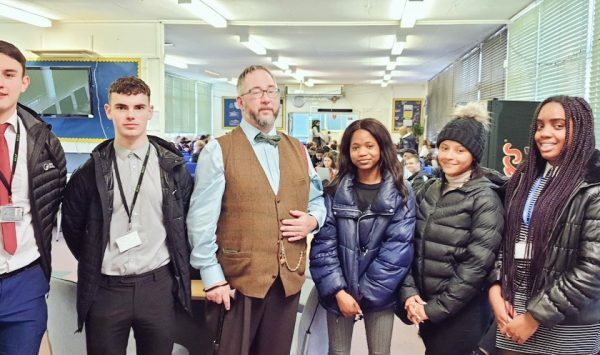 On our last visit to Manchester we spoke at Parrs Wood High School. On the 18th we were very pleased to revisit this excellent school. After the 2017 Manchester Arena bombing, the school’s choir recorded the title track from Ariana Grande’s My Everything to benefit the victims. The choir then performed the song at the One Love Manchester concert along with Ariana Grande to further honour and aid the victims. Once again, our visit here was emotional and inspiring. The students here have really embraced the rejection of hatred. On the 19th GAU presented twice to the quite wonderful Burnage Academy for Boys. Our level of engagement was extremely high in Manchester however this modern impressive school set new levels. Our visit here was quite memorable. It really was a pleasure to have visited here, and we were back at the end of the tour. On the 20th St Peter’s RC High School was the venue for the two presentations. There were many questions from the students of this quite beautiful school. The reception from the students was warm and compassionate. After the presentations there were many students wishing to speak with me. The singer Shayne Ward went to this school. 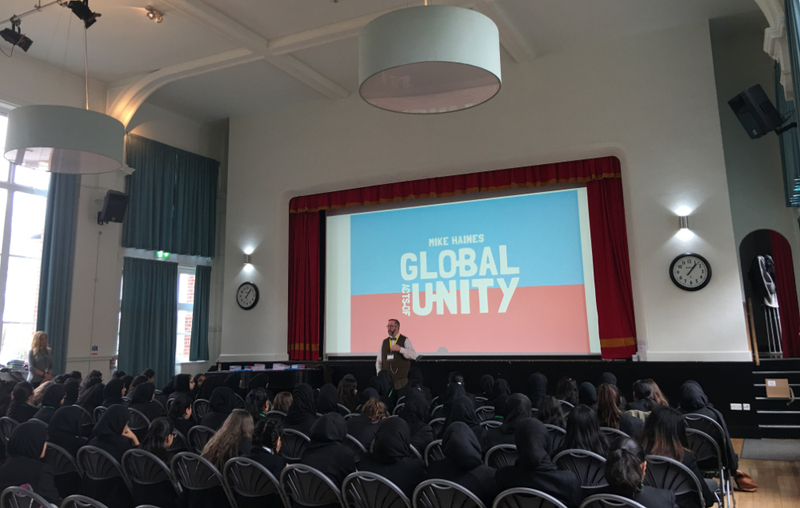 The 21st saw GAU at Levenshulme High School for Girls. This is a beautiful school that has appeared in Coronation Street and other programmes. There were many tears at this school and many hugs from the wonderful students. I could see that the girls here recognised that hatred is a choice and they were not going to choose that path. Manchester Health Academy was the venue for the two presentations on the 22nd. This extraordinary, modern, beautifully equipped academy was a real eye opener. I had some good hard questions from the students. One thing we like at GAU is tough questions and MHA supplied them. That afternoon GAU visited Khizra Mosque with Figen Murray and Steven Hardy, who both lost loved ones in the Arena bombing. 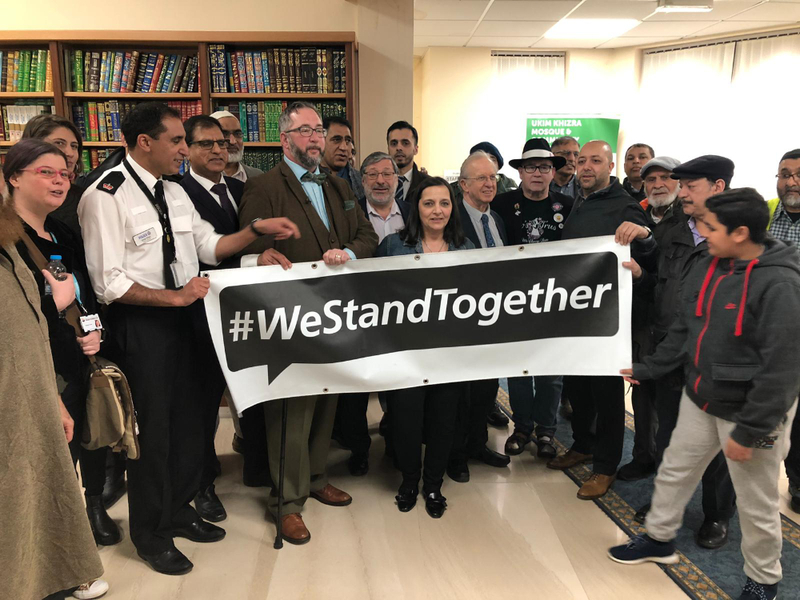 Along with members of the mosque we stood in solidarity with the Muslim community in the rejection of hate after that cowardly attack in Christchurch and the subsequent attacks on mosques in our country. 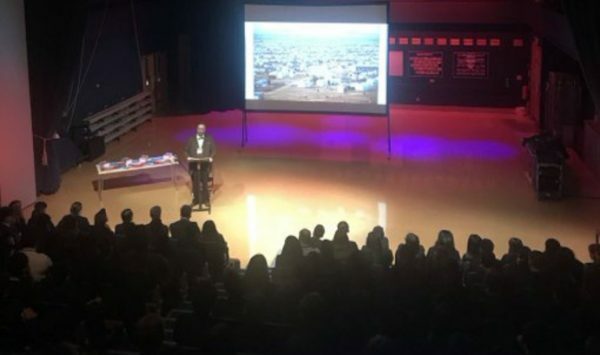 On the 25th of March GAU presented at the Manchester Co-op Academy. Another ultra modern school set in gorgeous grounds. This school had all the latest technology available to us. This school is business focussed with mentorship from companies. The GAU visit here was very successful and the students readily adopted the rejection of hatred. The 26th of March saw us at Manchester Enterprise Academy. MEA is another of Manchester’s ultra-modern academy’s and has close ties to Manchester United. Once again, our visit was well received by the students. Another great day. The last day of the tour 27th saw us revisiting for the third time Burnage Academy for Boys. It was grand to end our visit to Manchester at such a wonderful school. Once again Burnage Boys did not disappoint, the students were confidant in coming forward to ask questions and have discussions with me. Manchester has once again been a wonderful time. I met some inspiring young men and women, shed tears with others and been touched by the compassion of the Manchester youth. A colony of decorative, super-sized worker Bee sculptures sited in a trail all over Manchester decorated the city and surrounding area. At the end of the Bee trail the bees returned to the places that decorated them. Here are some we spotted at the schools that decorated them. Manchester you were wonderful. Thank you to all who made our visits possible and of course a massive GAU thank you to the students of this wonderful city. Our Flying Visit to Derby.